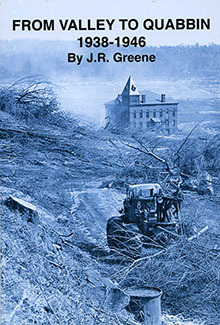 HISTORIAN J.R. Greene tells the story of the last months of human habitation in the Swift River Valley. The winding up of local institutions, destruction of the valley, and its subsequent flooding for the Quabbin Reservoir are also described, including the use for the reservoir for bombing and artillery practice during World War II. Using quotes from contemporary news accounts, interviews with people who were there at the time, and rare illustrations, the author tells the sad story of the last people to leave that doomed valley, and how they felt about losing their homes. J.R. Greene is a lifelong resident of Athol, MA, where he is active in local government and civic activities. He is the author of eleven atlases and other books relating to the Quabbin, an atlas on Athol, four books on Massachusetts railroads, and three on Calvin Coolidge. He is also a dealer in coins and collectibles.